In the past week, Google went live with a service it had announced back in May of this year, allowing for ‘families’ of Google accounts to share most purchases made across all of Google Play. I use ‘family’ because it is open to any 6 accounts you want to use. Friends, co-workers, or any other person can be a part of your ‘family’ if you like. The service is called Google Play Family Library and should be showing up in most people’s accounts as of this writing. In this post, we’ll talk about what it is and why it will be awesome for Chromebooks in the very near future. 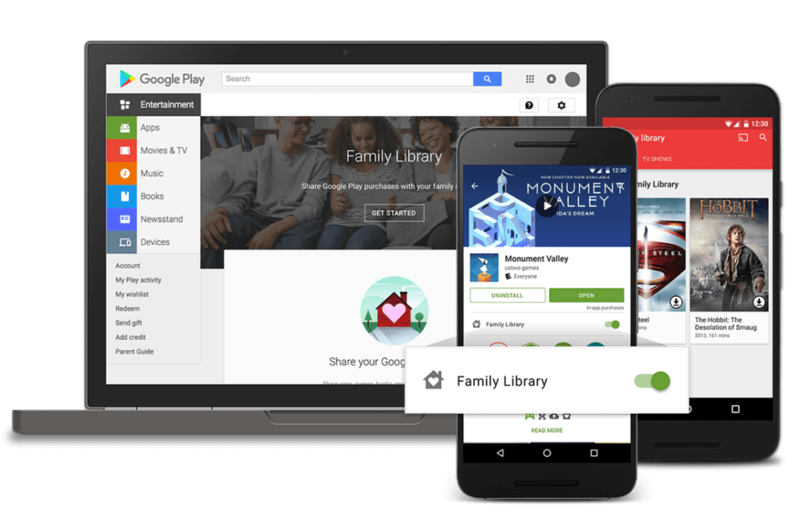 As the service states in its name, Google Play Family Libraries allow up to 6 accounts to share purchased apps and media across all your devices. For my family, for instance, we have a total of 4 Google accounts in the house. A co-worker and his wife round out our 6. As a linked ‘family’ account, we are now able to share the single purchase of, say, Monument Valley (amazing game, BTW). Beyond that, it also allows us to all view purchased and rented movies along with giving us all access to Google Play Music All Access ($15/month subscription for the ‘family’) and YouTube Red for all 6 accounts (provided you have signed up for All Access). All-in-all, it’s been pretty sweet thus far. The kids have access to all our purchased movies on their devices and, though I’ve purchased multiples of some games before this rollout, moving forward we will only need to purchase things once. One caveat applies here, though. In-app purchases don’t fall under the umbrella of Google Play Family Libraries, so those things you’ve purchased within a given app aren’t subject to sharing. This has led savvy developers to expand on games via in-app purchases to avoid losing out on revenue. Monument Valley released what amounts to a sequel to the original, but packaged it as add-on levels via in-app purchase. And I’ve paid for it twice. But, this arrangement is still WAY better for most people and we are glad for it overall. For Chrome OS users, this will also be a great deal. As Chromebooks become cheaper and more present in younger user’s hands, Android apps will be utilized heavily. With the ability to share apps across accounts, Chromebooks get included in the sharing action and all your purchased apps can be shared over to Chrome OS devices with simplicity. So, for families with multiple OS’s (Windows, MacOS, Android and iOS – all users usually still have a Google account), one purchase of an app on a phone can be shared to another account without friction or the need of other Android devices. Overall, Google has created a very seamless, simple way for users to embrace their ecosystem and decide, perhaps, to go with a Chromebook and Android phone versus an iPhone and iPad. It makes a lot of sense and will likely sway some decisions over the next few months as new Chromebooks in various shapes and sizes begin to hit the market with Google Play in-tow.